After generations of intensive training, a group of fruit flies has been taught to count. Thanks to its blindly short lifespan, the humble fruit fly has long been a favorite test subject for scientific experiments of various stripes. Their utility lies specifically in how quickly the flies can reproduce, with little baby fruit flies reaching effective maturity only eight days after hatching. 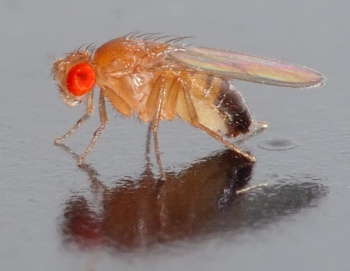 By capitalizing on this speedy cycle, an international team of scientists and researchers has been able to do something amazing: they've managed to breed fruit flies capable of counting after 40 generations of teaching. The team, made up of researchers from the University of California and Canada's Wilfred Laurier University, taught the flies to count by putting them through frequent, 20 minute long "math lessons". The lessons were based on subjecting the flies to two, three, or four flashes of light, with a rapid shaking of the container housing the flies following either the two-flash or four-flash pattern. The first 39 generations of fruit fly, being unable to distinguish between the different flash patterns, would not prepare themselves for the shake that invariably followed these patterns. Generation 40, however, proved capable of distinguishing between the number of flashes and preparing themselves for the shaking they knew would follow two or four flashes of light. "The obvious next step is to see how [the flies'] neuro-architecture has changed," said Tristan Long, a geneticist from Wilfrid Laurier University. Long added that the likely first step in this process will be to compare the brain structure of the numerically literate flies with that of untrained flies, in the hope that this comparison will enable the researchers to pinpoint precisely the mutation that allows the children of the trained flies to count. Scientists hope that information gleaned from this investigation will allow them to better understand the mechanical reasons behind human problems with numeracy, including the learning disability dyscalculia. The evolution of these mathematically-minded flies adds further weight to the theory that basic numerical skills are ancient, ingrained constructs, something that we see in various places throughout the animal kingdom (baby chicks are an especially cute example). It'll be interesting to see what exactly it was that changed in the flies, and how the mutation developed through the 40 generations of trainees; will we be able to identify similar mutations across other species? Also, let's not speculate over what they might learn next, ok? I'm still recovering from The Fly (seriously, it was horrifying).